Do the work. Do the analysis. But feel your run. Feel your race. Feel the joy that is running. I’ve had this quote from Kara Goucher on each page of my training plans for as long as I can remember. January first through Sunday, April 27th, embodied it completely. 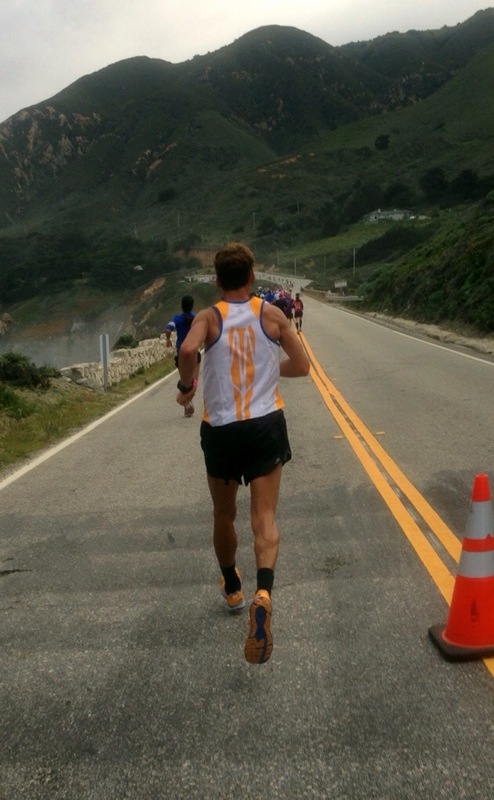 On April 27th, I ran the 29th presentation of the Big Sur International Marathon. An event that sold out in a record 59 minutes last July and one which will, no doubt sell out again for 2015. It’s just that beautiful of a race – or, as many categorize it, an experience. All races have basic things in common: start line anticipation, on-course challenges and highs, satisfaction in crossing the finish line, and the R&R and camaraderie aspects of the finish area. Big Sur has that and more. Amazing scenery. Camaraderie before, during, and after the race. Sounds of nature and music on-course. Quite simply, words or pictures just cannot capture the Big Sur experience – you have to do it to fully grasp, understand, enjoy, and appreciate. A runner can watch endless YouTube videos, read race reports, listen to other runner’s descriptions, drive the course, and check out photo feeds; however, until one runs it on foot with 3300 fellow athletes, they just will never know the full experience. I went in to the race with a plan [first line of the quote], but didn’t meet my goal. When I knew things were not going to end up as I planned/hoped, I made adjustments along the way and refined my goal [second line of the quote]. In the long run, it was an awesome day – yes, I was bummed – but I finished my second Big Sur and my fourth marathon [third line of the quote]. Finishers. There are actually several distances and categories that make up the Big Sur event. For the overall event, there were 6,522 finishers, for a male/female split 40/60. For the marque marathon, there were 3,337 finishers, up from 2012’s 3,121. The male/female split was about 50/50. Weather. The weather forecast fluctuated all week: 80% chance of rain showers down to 20% chance of showers in the AM. It ended up being a beautiful 54 degrees with little or no wind at all! Perfect running weather. Course. The 100% paved course is a point-to-point, that starts at Pfeiffer State Park in Big Sur and makes its way North along Highway 1 and finishes in Carmel. As is the case with most course elevation charts, look at the different versions of the Big Sur course elevation and you go away with different perspectives of the he course. In my mind, it is a course made up predominantly of rollers – with one significant hill (the 2-mile, 500’+, Hurricane Point) and its corresponding downhill. Management/Support. Course and event management, support, and volunteers were amazing! It’s tough to get lost when you are running on the highway, so marking was not an issue. The aid stations were spaced great and staffed by plenty of encouraging volunteers. For some reason, I think they were a bit more enthusiastic this year than last, but that’s me. I used the CamelBak “REFILL” program, which was spaced at every-other aid. That went well, though I ended up filling my handheld one aid ahead of a “CamelBak station” once. Post-Race. The finish chute and post race area had a great flow to it, as usual. One thing I appreciated (which I don’t recall from last year) was that they gave small cardboard box trays to runners so they could tote their food around…nice touch. There was the typical post-race food (bananas, bagels, etc.) and they also had minestrone soup and a beer tent, for those so inclined. Medal/Shirt. Each finisher received a ceramic medallion that was unique to their particular event/distance (marathon, relay, 5K, etc.) Event shirts (which are also unique to the particular event/distance) were picked up with bib packets and were actually pretty nice this year. I also picked up a finisher’s shirt at the finish line merch tent, which was actually nicer than the one from last year. It’s funny, before writing this report, I re-read my 2013 Big Sur Marathon report and there are quite a few similarities in the “Recap” section. I guess I’m consistent (which is the upside) – the fact that I made some of the same errors is the downside. 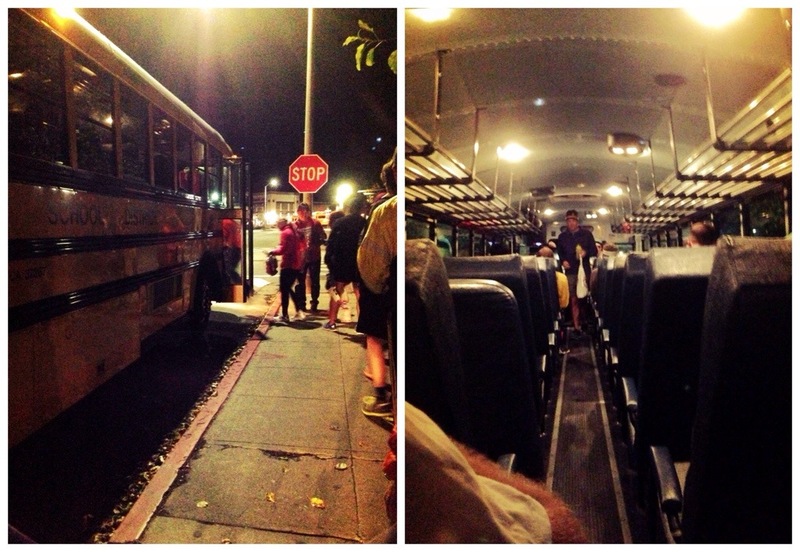 Since Big Sur is a point-to-point race, runners have to catch an o’dark-thirty bus to the start area. for that reason, I drove to Monterey on Saturday afternoon, checked into my hotel, and then hit the expo/packet pick-up. I ended up getting the same hotel room as last year, which was weird. I walked around the expo, did some window shopping at a store, grabbed a coffee, then went back to the room. My carb loading plans always have pasta for dinner one night and Chinese the other – usually in that order. Last year i followed that order, this year I switched and got pasta take out and took back to my room. I pretty much relaxed in my room all evening – watching TV, texting/talking with my wife (who stayed home), and basically vegging out/busying myself. I got my kit set and went to bed by 9:00, since my alarm was set for 0230. I was in the first bus group (!) and left at about 0345 for the start area. Like most of my fellow runners, I cat napped on the ride to the start – though mine came after I ate my bagel and peanut butter sandwich. After I got to the start area, I headed to the same location I chilled in last year – it’s away from the food and bag check areas, less illuminated by the flood lights, and the lines for the porta-potties are short. I hit the porta-potty first (love being the first user!) and then claimed a spot on the curb to sit for the next 1.5 hours. 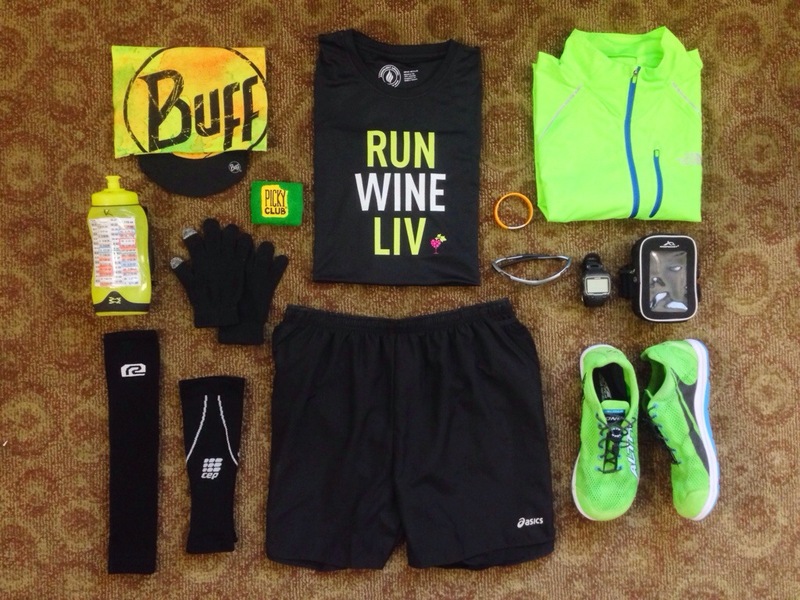 With about 45 minutes to go before the start, I got kitted up – compression sleeves, arm sleeves, packed my sweats, etc. I hit the porta-potty one final time, checked my bag, and headed for the second wave area of the start. The start area is a great pre-race experience. You get to hang out with people, swap stories a bit, and just veg until the start. I actually like looking at shoes as people walk by – I noticed a LOT more Hokas this year. Most of the time, though, people keep to themselves and probably try and calm the nerves…which is what I mainly did. They called for runners to the start (which they do in reverse order, because the highway is closed and space is tight), did the typical announcements, sang the National Anthem, and in short order, the first wave was off…on time. I was in wave two and we also were off on time too: 0650. My goal for the day was probably a stretch. It was actually more aggressive than the projected time I got using the pacing spreadsheet i got from MyMarathonPace.com; which, based on my best, flat marathon and their Big Sur factor, was 3:53:04. I went with 3:50…it seemed doable, so I planned pacing for that finish time. I paced Dean Karnazes for a few miles. OK, I said “Hey Dean!” as he passed, he said “Hey!”, and then I ran behind him for a while. He had actually already run the course backward (finish to the start line) and was on his way back to Carmel to round out a 52.4-mile day. I had a quick convo with Ethan Newberry, AKA, “The Ginger Runner“. He was wearing the new Altra The One2 in prep for reviewing them on his website…I was wearing the 1.0 version. I ended up running ahead of him, only to be passed by him a after my mile 18 slowdown. Even though I was trying to maintain the 3:50 pacing, I really enjoyed the scenery. I even took some photos along the way – though my on-course photography stopped at around mile 18 with a picture taken at Granite Canyon Bridge. After that, I became focused…and tired…and left the iPhone in my Armpocket. After mile 18, the race goal shifted to simply PRing – beating my 3:59:45 time from last year. I ran/fast walked/ran after mile 18, monitoring my pacing on the Garmin. At about mile 22, the 4:00 pace group caught up to me (!) and I ran with them for about a mile, which was nice. The pacer was an excellent pacer, really encouraging people and providing constructive advice and coaching. I’d run with him anytime! That said, I was not able to keep up with the group, so I dropped back to a run/fast walk/run pattern…still monitoring my Garmin. Things were looking OK and at about mile 25.5, I tried to give it one final push to the finish. That lasted about a half mile and I needed to fast walk a bit…I was pretty tired at that point. Again, I wasn’t bonked, just had tired legs. Of course, I sprinted to the finish from mile 26. I wasn’t sure what my official time was until I slowly made my way to the results tent, where I learned that I gritted out a PR by 18 seconds! Was I bummed that I didn’t make 3:50? Yes. Was I happy that I PR’d? Oh, YEAH! Do I think I could have done 3:50? Possibly. Do I think I could have made 3:53? Yes. I crossed the finish line, picked up my medal, my food, and slowly looked for a shady place to hang out. My leggies were tuckered out – all other systems were perfectly fine. Fueling. Pre-race, carb loading: I did my standard, marathon routine: 36 hours of >80% carbs and +1100 calories above my normal day. Race-day fueling: Bagel with 2T peanut butter at -3 hours, 1/2 a GU Chomps at -45 min, the other 1/2 of the GU Chomps at -15 minutes. At race time, I had been trying Tailwind Nutrition’s product for about three weeks and used that exclusively for race fuel, supplemented by a cups of water from several aid stations. Tailwind worked as advertised and, rather than detail it here, I will follow up this race report with a specific post about my use of Tailwind. Equipment/Kit [head to toe]: Buff cap, Tifosi Tyrant 2.0 sunglasses, tech shirt from the Livermore Half Marathon, Armpocket armband, Road Runner Sports arm sleeves, Garmin 910XT, tech touch knit gloves from Target, Picky Bars #TeamGreen wrist band, Road ID (Slim), Amphipod handheld, ASCIS 55 Shorts, CEP Compression Sleeves, Road Runner Sports Dryroad socks, Altra The One shoes. I took my The North Face Better Than Naked jacket to the start (just in case), but ended up stashing it in my checked sweats bag since the weather was awesome. Had fun staging this shot in my hotel room…m’kay, I was pretty bored. Here are some photos I took. Again, on-course photography stopped at about mile 18 with the picture at Granite Canyon Bridge. Again, after that, I became focused…and tired…and left the iPhone in my Armpocket. At the end of the long straight-away! Love how everyone is looking at the ocean! View from Hurricane Point – Bixby Bridge in the distance. Bottom line: NEW PR! Learned about setting realistic goals and respecting the distance. I need to add more hill work and some core strengthening exercises to my training plan. Post-race meal: Drove home from Monterey, showered, and then went to Famous Dave’s for some RIBS! Thanks! You def need to try and do it. Cheers!